Thanks for the letter. I was actually going to suggest that because of my coming home for the Wedding you didn’t come up these holidays. However, it must’ve slipped my mind when I wrote. Note the “new” address. It is not actually new, but has been an alternative address. However, because the Greenmeadows Post Office had to give all our mail to the Taradale Post Office every day, we have been asked to spread the word round that the Taradale address is to be preferred. So please could you tell the rest of the family. I have just come in after spending a week out at Waimarama, It was very enjoyable, & quite sunny & warm for most of the time. On Monday I begin my week’s teaching at Hastings' Boys High. We wear mufti. The Headmasters of both Hastings & Wellington College are close friends of Fr. Mannix – when he was Rector of St. Pat’s Town. So those two schools are very keen to let us come & observe. Also, they are first class schools, & many from Training College do “section” there throughout the year. So we will appear to be nothing out of the ordinary. Samoa (St. Peter Chanel’s) – operated from N.Z. 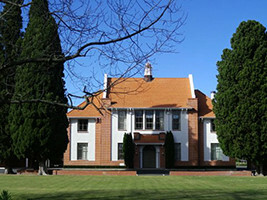 Then there is the University Hostel – Rochester Hall – in Chch. ; & “Highden”; & “Greenmeadows”; and “Aurora Terrace”. The reason what reminded me of all this is that I’ve just received an Index of the S.M. There are about 290 Marists in the N.Z. Province – the largest in the world other than Oceania which has 319 (about 50 of these are N.Z.ers trained here). As you can see, there’s not much news this week! so I’ve given you all the statistical facts instead. There’s the bell for lunch. P.S. On what date are you retiring from the M.O.W. Dad?